This is the fourth post in a series about our front-yard water line emergency that occupied much of the Thanksgiving holiday week. Our plumber returned today with digging and trenching tools. The yard dig is on! 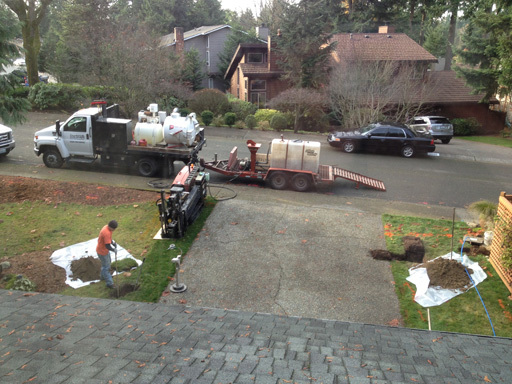 I’m quite satisfied with my choice of plumber – Top Gun Plumbing located in Bothell, WA is great. I hope people in the Puget Sound area trying to find a good plumber find this post and give them a call. Are they timely with responses? Are they on time to the job site? Do numbers they quote seem reasonable? Can you actually read what they write on your estimate? You don’t want ambiguities here. Do they explain stuff? Ask 1st grader questions – if you’re shelling out thousands of dollars, you get to ask 1st grader questions. If your project requires digging, do they seem eager to “play by the rules” with permits and utility marks? Waiting on a permit and utility marks did not add wait time to the job, and Top Gun coordinated everything. All I had to do was pay – perfect. If you’re not sure what’s a reasonable cost, get more estimates and search for your job on Google. Doing this saved me $4200, do not skip this step! It takes time to get multiple estimates and explain your problem repeatedly, and I am just as guilty of skipping the “get multiple estimates” step, but on these bigger jobs the grind pays off: you will get a wide range of professionalism and costs, even among pros with high marks on Yelp and Angie’s List.